How Can I Make My Brand’s Web Video Clickable? Web video that viewers can click! As a business, one of the most important things we need web video and video marketing to do is direct traffic and customers to our site. After all, that’s what we produced it for. However, there’s a small issue here. When maximising the reach of your video marketing by uploading it to YouTube or Vimeo, there’s the possibility that the video may be viewed in isolation on the Youtube or Vimeo page itself. Even if we embed the video on our own website, people should be able to find it independently online. If they do, we’re hoping that the viewer will click through to us (on the URL in the video description that you should ALWAYS include) so that we can receive the desired amount of traffic. However a better solution is to make the actual video window a live clickable experience. This is very useful if we want to maximise the reach of our web video by embedding the video on numerous other web pages where the ‘info’ section of the YouTube video which would normally contain your hyperlinks won’t be shown. This is where YouTube’s annotation function becomes very powerful. Youtube allows us to overlay a text ‘call to action’ annotation containing a live URL link anywhere on the web video window itself. The best example of this would be at the end of a film where we usually have an on-screen CTA, by using this facility we can actually make the CTA a live clickable element providing a great way to direct traffic from YouTube to our own site quickly and more intuitively. If part of the video is asking you to ‘click here’, you’re more likely to do that than go searching for a link in the video description. 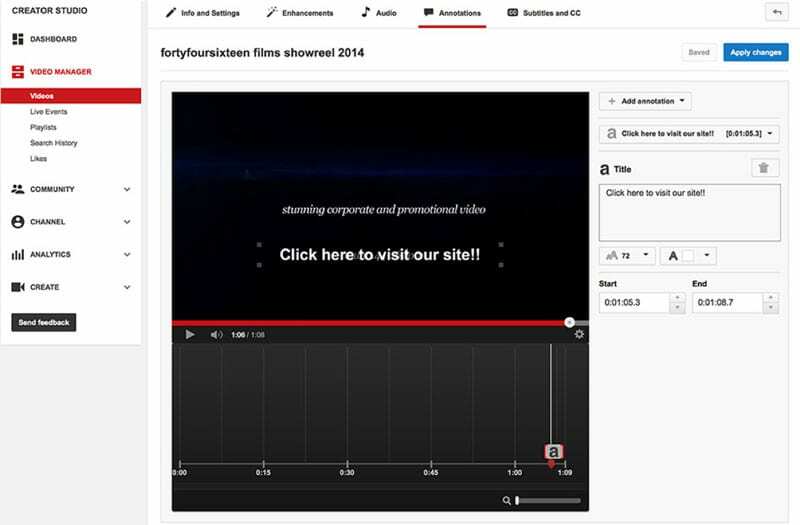 Simply upload your video to Youtube, then go to the “Channel Video Manager”. Next select the video you want to add the link to and click the down arrow to the right of the Edit button and then select Annotations. Add your link and then select publish to finalise. Easy! Firstly, it can take a few days to implement this, as the first stage is to notify Youtube that you are the physical owner of the video. Obviously this is to stop people placing live links over any and all of Youtube’s most popular videos, so you must own the content of film in order to place the live link on it. This part of the process is not instantaneous – Youtube takes a couple of days to verify this, so if you’re hitting a tight deadline you need to plan ahead. Secondly, the fonts, colours and typographical options are very limited, so if you have very strong brand identification that is linked to your own font or particular colour then you may struggle to create the most “on brand” annotation. Thirdly, the viewer has the option to turn off these annotations before they’ve even seen them. Some Youtube videos grossly overuse annotations which can turn many viewers off the idea, so make sure they’re relevant and not overused. That being said, the benefits to this are clear and until now this has been the missing element in many web video campaigns. Allowing users to interact with your content in this way provides engagement, credibility, and most importantly points the customer directly to your brand.